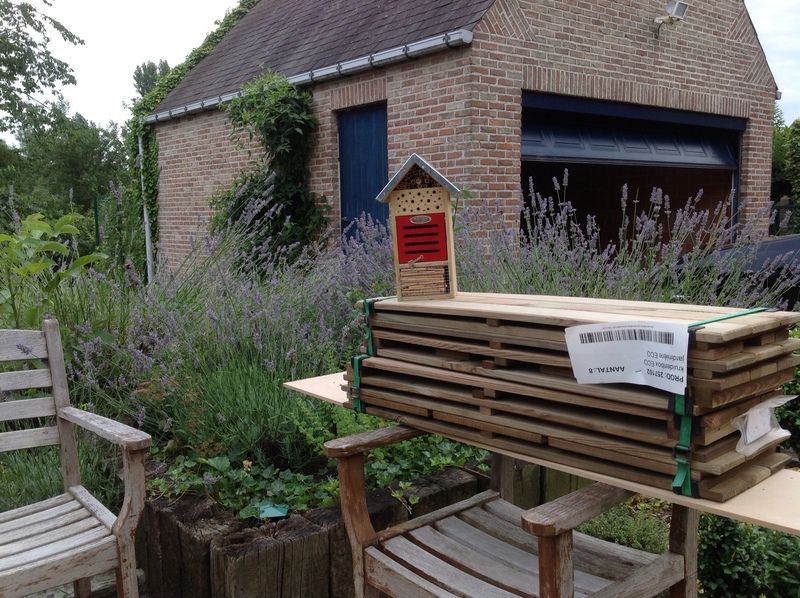 Work in progress: Follow the construction of our insects hotel. We have a rough idea in mind of what the hotel for insects should look like, but eventually the ideas grow as you accomplish them. Lacking any experience with wood, or whatever construction material, it is only by learning from our mistakes that the end product will take its final shape. 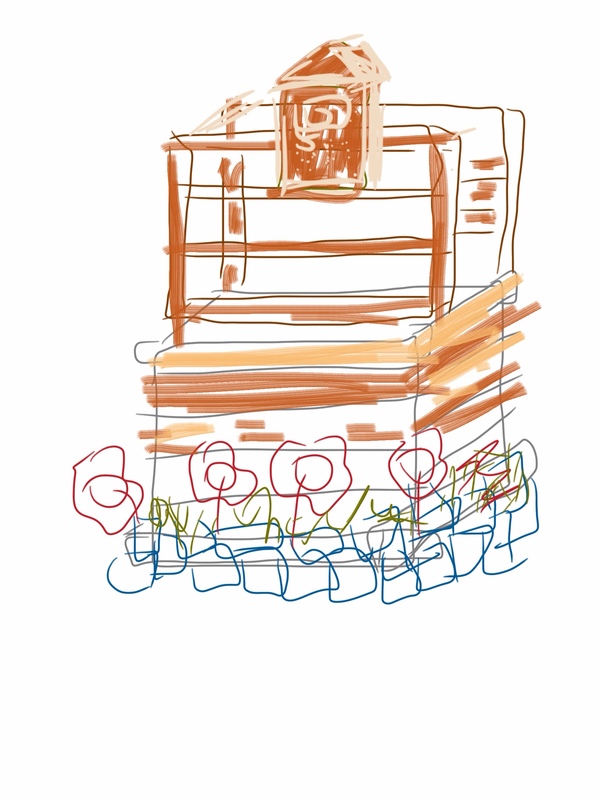 We are not yet convinced as to where the little chapel will come: integrated or on top… We will see when we get to it.. 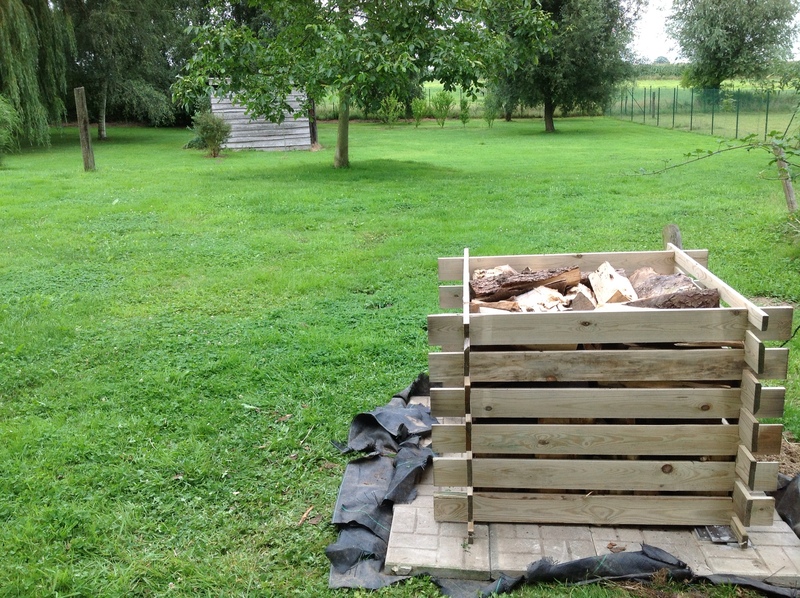 The hotel should be at least knee high, but we opted to give it a solid basis made of an half open wooden container that we have filled with bricks of wood meant for the fire place (we will of course regret this next winter when it freezes like on the Arctic). 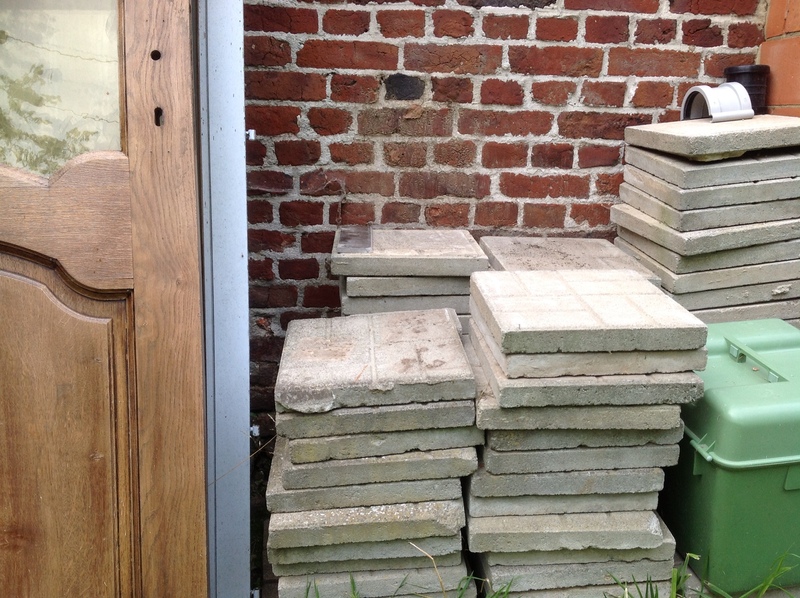 The wooden bricks are meant to attract by itself already insects, and they have been cleverly piled up by Chris to discourage rats and mice to sneak in. Mind you, the foundation is built to support even the visit of an elephant should it ever get the idea of sheeking shelter in our guest place for our little flying friends. Heavy concrete tiles are laid upon a cloth to keep the bad weeds away. It will thus be also a tidy place to live in! 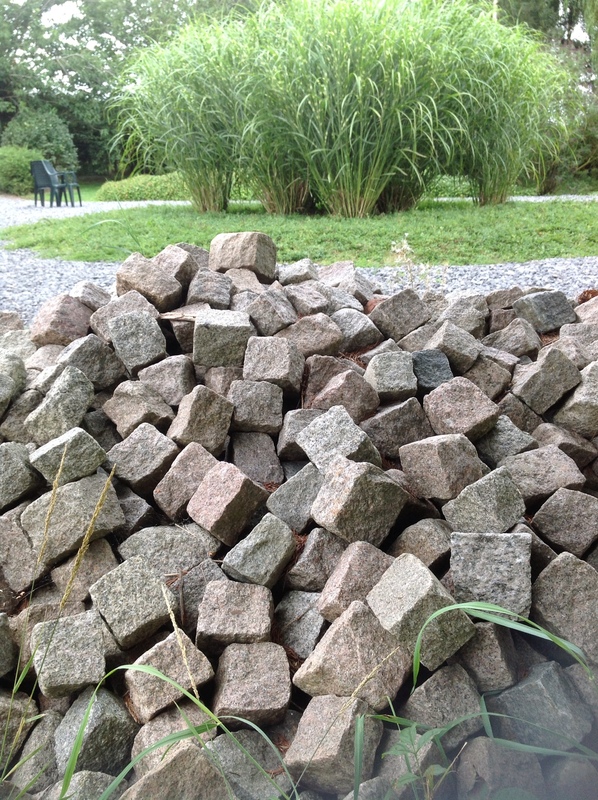 Around the bottom we will pile up cobblestones that will be filled between them with fertile soil to sow herbs and flowers. Thus: solid, tidy and attractive and green. What can possibly keep the insects from miles around to come to this resort? The way to hell is paved with good intentions, as always. Already from the start we made a huge mistake due to uncareful scouting of the location. The tiles were already positioned before we realised that not only the orientation of the hotel was not optimal towards the sun, but that on top we had no view on it from our future living room. 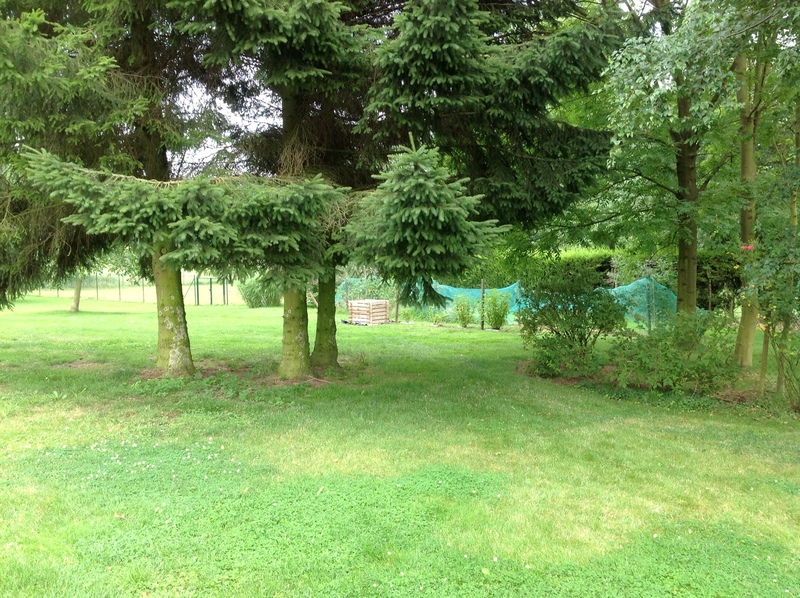 The only option: restart the foundations and rebuilt them next to the spot where we grow some small fruit, where the early sun will warm up the place, and where our view on our future guests will be perfect. So, this is what we have so far after pouring liters of sweat under a ruthless sun. Tomorrow, we hope to construct the next floor of the hotel, using in fact wooden containers for cultivating herbs, but flipped on their side.